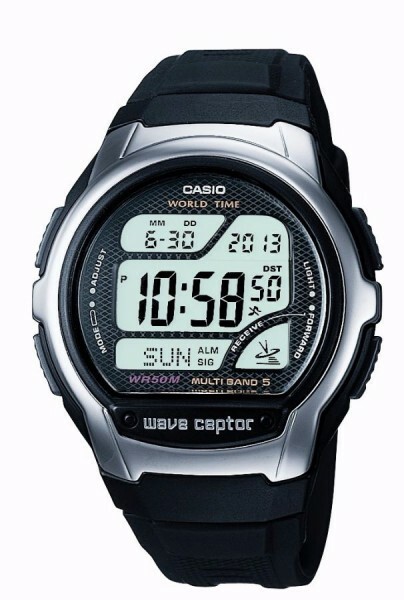 This Casio Wave Ceptor watch utilises Multi Band 5 radio controlled technology and World Time to drive seamless global time synchronisation. The watch is housed in a stainless steel and resin mix case for optimum durability and is framed by scratch resistant mineral glass. Perfect for outdoor and everyday styling. Illuminator An electro-luminescent panel causes the entire face to glow for easy reading. Includes an After-Glow feature that keeps the illuminator turned on for a few seconds after the light button released. Countdown Timer A stopwatch that counts backwards: When 0 minutes, 0 seconds is reached, the timer emits a 10-second signal tone. Multi Band 5 Radio Controlled A built-in radion signal receiver ensures that the exact time is displayed across Europe, The United States and Japan. Daily Alarm The Daily Alarm sounds each day at the time you set. Stopwatch Accurate measurement of elapsed time with a touch of a button, 1/100th Sec Stopwatch Water Resistant 50 Metre / 5 Bar, 5 Bar Water Resistant means that the watch is also suitable for swimming but NOT snorkelling World Time Displays the current time in major cities and specific areas around the world.